Science got it right… Maybe we can now accept the reality of climate change? Along with a zillion other people in the US, I witnessed the total solar eclipse today. Yes, it was amazing and yes, I feel somewhat addicted. The quality of light just before totality was something I’d never before experienced –and the sun’s flash just as it reappeared was something I’ll never forget. Apparently the next one will be in South America on July 2, 2019–and the next one in the US will be April 8, 2024. Oooh! Sun’s corona as seen during the total solar eclipse, August 21, 2017 from Salem, Oregon. Amazing that us humans can accurately predict these phenomena –to the exact place and time –to the second. Seems like our predictions work! These predictions, of course, are grounded in the physical sciences. At the same time, many people insist that scientists are mistaken or misguided when they predict global climate change. I wonder if any of those people saw the eclipse. If so, they might want to reflect on their contradiction. This monument marks the position of the front of the Athabasca Glacier of Alberta, Canada in the year 2000. Photo taken in 2012. In January, I started teaching the Introductory Geology course “Environmental Geology and Landform Development” –with two lecture sections of about 200 students each. And this course, populated largely by folks who are fulfilling a science requirement and otherwise try to avoid science like it was the plague, needed some general statement about science. After all, it’s science that may someday save them from the plague! So science… what is it? Seems like scientists themselves have a zillion different definitions, so I started with “Scientist. –What’s a scientist?” If you google “scientist” and then look at the images, you see this. As this image is a screenshot of photos that aren’t mine, I intentionally blurred it, but you should get the idea of what’s there. Really??? these are the most popular images of scientists and in every picture–save the tiny one in the lower right– is some person in a WHITE LAB COAT and a microscope or a beaker. Ironically, it shows about 50% of the scientists as women. Go figure there too. Looks like we’ve been fed a misrepresentation of what scientists are. We actually do a wide variety of things. In geology, we do a wide wide range of things. We spend time in the field (see picture below), we write, we draw maps and cross-sections, we look down microscopes (maybe in jeans and t-shirts), we write computer models, we do experiments, and we sometimes wear white lab coats. Geologist inspecting a fault zone between the dark-colored Beck Spring Dolomite and the overlying light-brown Noonday Dolomite. Death Valley, California. All the time, we’re trying to understand something about our world. Our universe. We’re collecting information (data). We’re testing ideas. We’re adding detail to somebody else’s ideas. We’re building a framework of knowledge that’s grounded in our observations and testable ideas. Replace the word “ideas” with “hypotheses” in this paragraph –and you get science. Ideally, most scientists approach their work using the “scientific method” –which is a highfalutin way of saying they see something they don’t understand (an observation), which causes them to ask a question (like how did this happen? ); they come up with ideas (hypotheses) that may explain it, and then they test those hypotheses. Which is what we did in class with icicles! The month before–in mid-December–Eugene had this incredible ice storm, which covered everything in ice to make it look like a scene from the movie Frozen. It was beautiful and destructive. And we can all pretty much guess how icicles form: water starts to drip off the branch but freezes before it falls off. Icicles grow straight downward off the branch because water, like everything else, falls vertically with gravity. As it turned out, some of the icicles seemed to grow straight out from the branches. Look at the photo below! How could this be? We know icicles should grow straight downwards! So as a group, we came up with some hypotheses, shown below next to the picture. I was the proud sponsor of hypothesis #4 and #5. As a group (all 200 of us), we could rule out hypothesis #3, that the picture was rotated. I shot the image and promised I didn’t rotate it! We could also rule out hypothesis #4, that the ice somehow grew horizontally towards the branch, because that idea conflicted with all previous observations we’d made on icicles, that they grow away from the branch as ice progressively freezes. That left hypotheses #1, #2, #5. We figured ways we could test #1, #2. If it were the wind, for example, we’d expect all the icicles to go in one direction in a given place, regardless of the limb angle. If it were #2, we might expect to see some icicles show a curve to indicate progressive tilting of the branch–which you can actually see in the photo above! Hypothesis #5, that “Some magical force caused it to grow sideways”isn’t testable. It’s NOT TESTABLE. We can’t come up with ways to support it or rule it out. You can believe it if you want to, but it’s not science. That’s the point. To be scientific, a hypothesis must be testable. Most of us hold various non-scientific beliefs in our hearts that we know to be true –for us. I think that’s a good thing. For many of us, those beliefs lend us qualities like strength or courage or compassion when we need them the most. They’re still not scientific. And that’s what really gripes me about the “scientific creationists” –as well as today’s Republican Party. The “scientific creationists” say they use science to demonstrate the existence of God, or that Earth is young –when believing either requires a suspension of science and an act of Faith. By claiming they’re being scientific, the “scientific creationists” hamstring their own belief system. They take the wonder out of religion and render it baseless and sterile. And the Republicans? They’re now all about “alternative facts”. Maybe it’s unfair to group “all Republicans” together –but I see very few standing up to this reckless leader we have. Maybe they just lack integrity. A trip to Death Valley over Thanksgiving two weeks ago reignited all sorts of things in my brain, one of which being my love of conglomerate. Honestly, conglomerate HAS to be the coolest rock! Tilted conglomerate in Furnace Creek Wash, Death Valley. Just look at this stuff! Just like any good clastic sedimentary rock, it consists of particles of older rock–but with conglomerate, you can easily see those particles. Each of those particles opens a different door to experiencing deep geologic time. 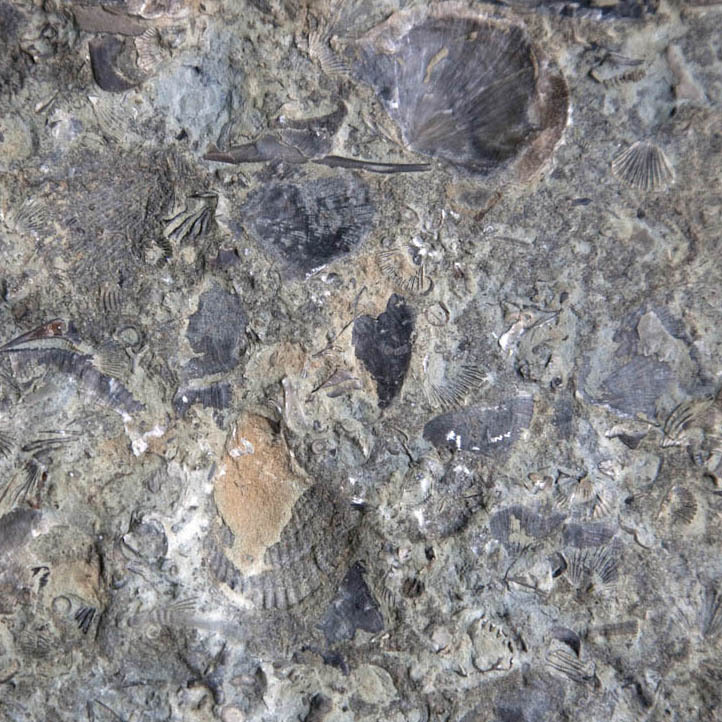 As an example, look at the conglomerate below, from the Kootenai Formation of SW Montana. It contains many different cobbles of light gray and dark gray quartzite and pebbles of black chert. The quartzite came the Quadrant Formation and chert from the Phosphoria Formation. So just at first glance, you can see that this conglomerate in the Kootenai contains actual pieces of two other older rock units. Conglomerate of the Kootenai Formation, SW Montana. But consider this: The Quadrant formed as coastal sand dunes during the Pennsylvanian Period, between about 320-300 million years ago and the Phosphoria chert accumulated in a deep marine environment during the Permian, from about 300-250 million years ago. The Kootenai formed as river deposits during the early part of the Cretaceous Period, about 120 million years ago. All those are now together as one. Similar to the modern river below (except for the glaciers), the Kootenai rivers transported gravel away from highlands –the highlands being made of much older rock that was uplifted and exposed to erosion. That older rock speaks to long gone periods of Earth history while the gravel speaks to the day it’s deposited. But this is where my head starts to spin: the modern gravel is made of rounded fragments of old rock –so when you look at a conglomerate, you glimpse at least two time periods at once: you see the conglomerate, which reflects a river or alluvial fan –or any environment near a bedrock source– and you also see the particles, which formed in even older environments. And it gets worse –or better. What happens when you see a conglomerate eroding? The conglomerate is breaking up into modern sediment, which consists of pieces of older sediment –that at one time was modern sediment that used to be older sediment? Look at the pebbles below. I keep them in a rusty metal camping cup on a table in my office. “Recycled” pebbles of the Kootenai Formation. These stream pebbles eroded out of the Kootenai conglomerate. So… they’re simultaneously modern stream pebbles and ancient ones –AND… they originated as the Quadrant and Phosphoria Formations. Four periods of time, spanning 300 million years, all come together at once. And if that’s not enough, those conglomerates in Death Valley? They contain particles of… conglomerate! Look! The arrow in the left photo points to the boulder of conglomerate on the right. If you click on the photos, you can see them enlarged. All those particles, which are now eroding and becoming modern sediment, were yesterday’s sediment. And the conglomerate boulder? It too is becoming “modern sediment” and it too was “yesterday’s sediment” when it was deposited on an alluvial fan with the rest of the material. However, it goes a step further: its pebbles and cobbles were both “modern” and “yesterday’s” sediment at a still older time. And before that? Those pebbles and cobbles eroded from even older rock units, some of which date from the Cambrian, about 500 million years ago. For fun, here’s a photo of another conglomerate boulder. Conglomerate boulder in conglomerate of the Furnace Creek Formation, Death Valley, CA. I can’t help but wonder how Young Earth Creationists would deal with these rocks. Given their story of the Grand Canyon, in which the Paleozoic section was deposited during early stages of “The Flood” and the canyon was carved during the later stages (they really do say that too! ), they’d probably roll out that same blanket answer: The Flood. End of discussion. No questioning, no wondering. In my opinion, one of the beautiful things about geology is that we’re always questioning and wondering. for more geology photos, please visit my website. Geologic Irony in Cincinnati and northern Kentucky! Deep geologic time everywhere –and the absurd denial of the Creation Museum. It’s been awhile since I’ve posted –too many things have been happening, like the end of fall term, other deadlines, and of course, coming down with a bad cold! But I did manage to visit Cincinnati, Ohio for Thanksgiving. I’m originally from Cincinnati, and I always enjoy going back. Besides visiting with old friends, one thing I love about the Cincinnati-Northern Kentucky area, is the incredible wealth of marine fossils in its rocks, which date from the Ordovician Period, some 475 million years ago. It’s always amazing to me that I can, almost at random, pick up a rock and see the remains of critters that were actually alive so long ago. It fills me with a sense of wonder, mystery, and awe that I’ll never be able to explain –and it demonstrates to me how I’m a part of the earth –not apart from it. marine fossils in Ordovician limestone from northern Kentucky –you can see mostly brachipods (they look sort of like clam shells) and bryozoa (branching coral-like things) in this rock. Really, these fossil-rich limestones are just about EVERYWHERE! Even many of the stone buildings and walls that you can see throughout Cincinnati, are full of Ordovician marine fossils. And what a wonderful setting! The Ohio river cuts through its original floodplain, now perched a couple hundred feet above the river. That’s actually a whole story in itself, because today’s Ohio River formed as a result of the continental ice sheet advancing across northern Ohio, and blocking the courses of several north-flowing rivers, such as the Kentucky and Licking Rivers. 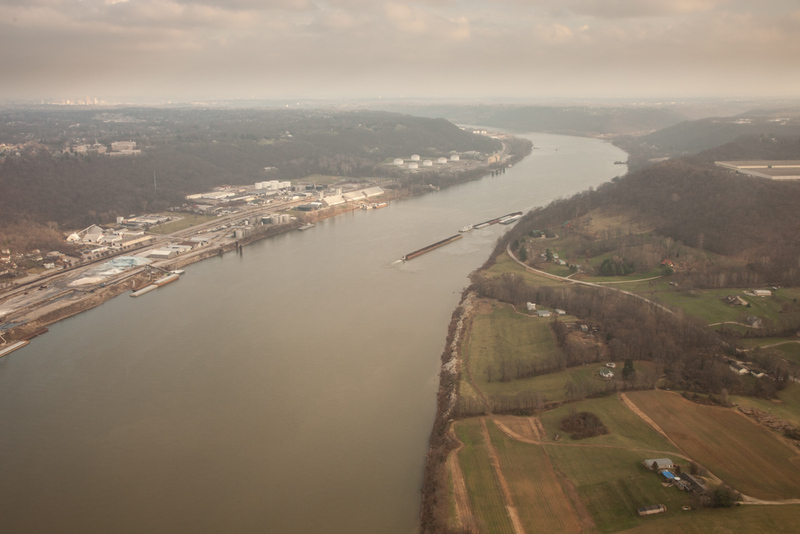 Looking up the Ohio River from the air –near where Ohio, Kentucky, and Indiana meet. And then there’s the Creation Museum in northern Kentucky, perched on the old river terrace above bedrock of fossil-rich Ordovician limestone and shale. One look at the two photos below and you can see what they’re all about. The explanation for fossils according to the Creation Museum (on the left), and a diorama (on the right) depicting a human being coexisting with a dinosaur. According to “The Museum”, fossils “were formed by Noah’s Flood (~4,350 years ago) and its aftermath” –and dinosaurs really did coexist with humans. In fact, I read that before Adam and Eve ate their apple, T Rex dinosaurs were actually vegetarian. But don’t take it from me that those limestones are actually very old (100s of millions of years, as opposed to 4,350 years). 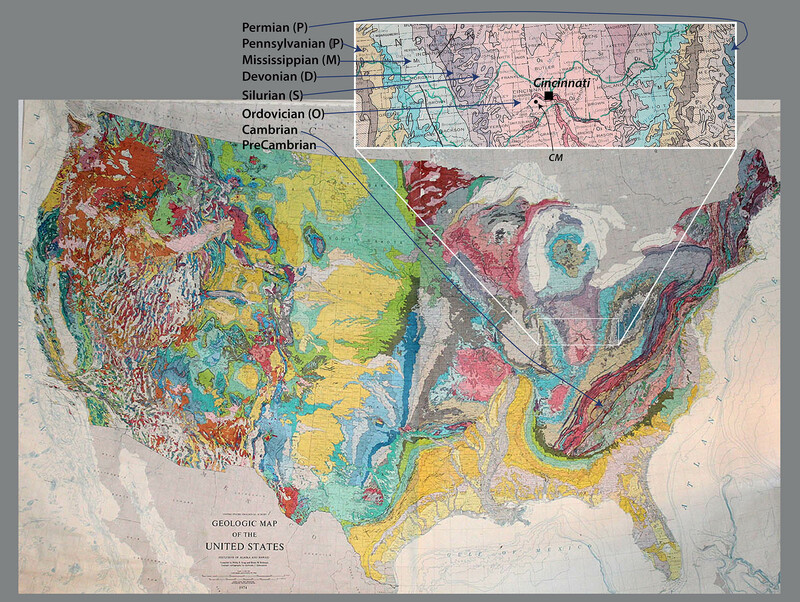 Take a look at a geologic map. 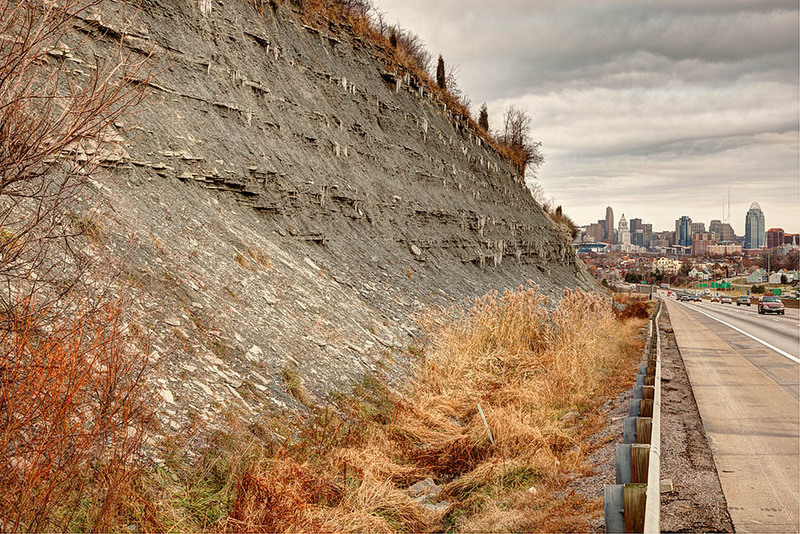 The Cincinnati-Northern Kentucky area is underlain by more than 1000 feet of limestone and shale –and if you travel eastward or westward, you encounter 1000’s more feet of marine sedimentary rock that sit on top the Ordovician. And the fossils in those rocks show a change with time, called evolution. If you think about it, you’re looking at a long long time to deposit –and preserve–all that sediment. Geologic map of the United States; the area around Cincinnati is enlarged. “CM” shows the approximate location of the Creation Museum. The Creation Museum tells us that all that sediment was deposited by “the flood”. Never mind that very little of the rock contains particles even as big as a sand grain. Below is a photo of a real flood deposit. As you can see, the deposit is very coarse-grained! It’s coarse-grained because large floods are very energetic and transport large particles. Coarse-grained sediment, deposited by one of the Missoula Floods in Oregon, some 15,000 years ago. The exposure is about 20 feet high. So the Creation Museum is asking you to BELIEVE that 1000s of feet of limestone were deposited by a flood, as well as the 1000s of feet of older rocks and 1000s of feet of younger rocks I didn’t even mention. They also want you to believe that T. Rex was a vegetarian who lived alongside Adam and Eve. But here’s what really bothers me: by misrepresenting science and promoting its own skewed interpretation of the bible as the literal Truth, the “museum” discourages people from looking at these beautiful rocks with a sense of wonder, mystery, and awe. It discourages them from inquiring into how those rocks really formed. The museum discourages people from learning important things about our planet and from forming their own views on the world. 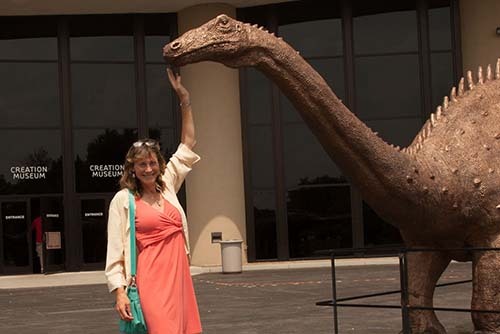 Me petting a dinosaur at the Creation Museum. Type “Ordovician” into the search for a few more photos of Ordovician fossils. 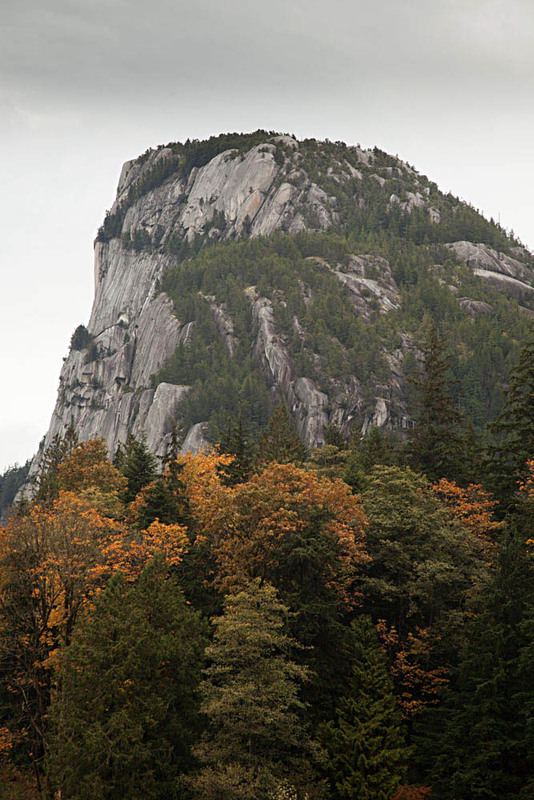 My friend Jessica and I skipped out from the Geological Society of America meeting in Vancouver last weekend to go visit the Stawamus Chief –a gigantic granite monolith near the town of Squamish. What a lovely place –and what a great respite from the craziness of a big meeting in a big city! I don’t want to repeat myself too much, because I wrote about this in an earlier post–but just the fact that granite is exposed at the surface requires deep time –inconceivably great lengths of time. That’s because granite forms from a molten state by slow cooling and crystallizing far beneath Earth’s surface –10 km or more usually –and THAT means the rock had to get uplifted and exposed at Earth’s surface through processes that we humans perceive as time-consuming–on the order of millions of years. Additionally, all the rock that used to be above the granite had to get eroded away in the process. 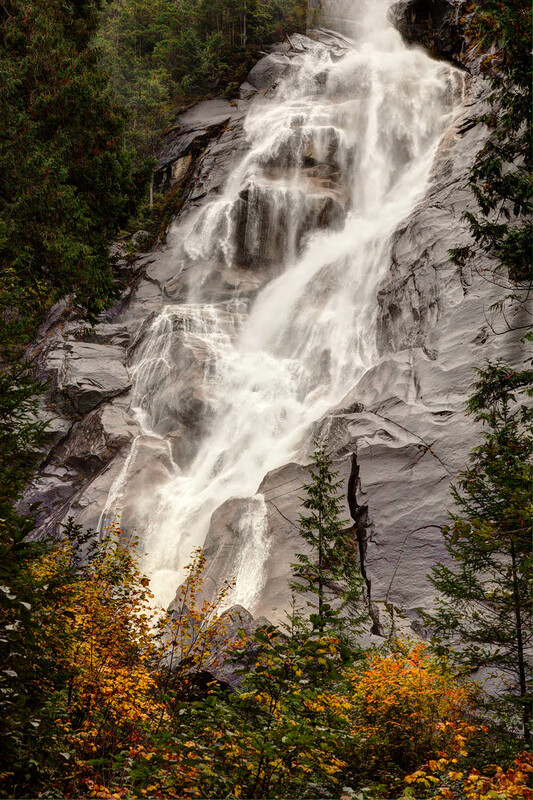 And Shannon Falls is right there too–Amazing! It sprays about 1000′ down a series of cliffs–and allows a good, up-close look at the granite. It’s actually granodiorite –which is a lot like granite except that it contains a lot more plagioclase, as opposed to alkali, feldspar. 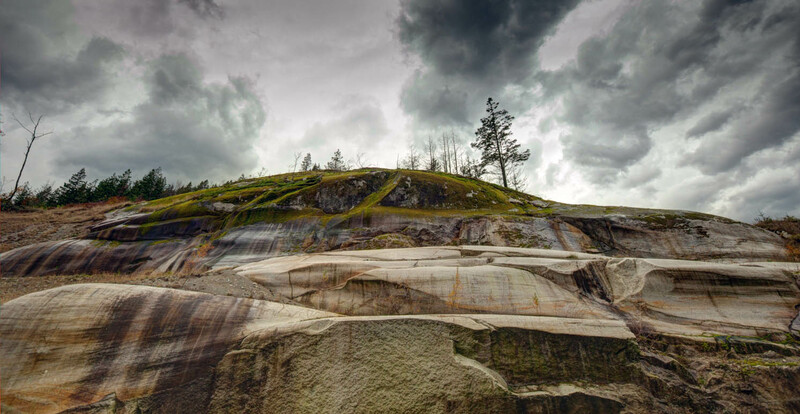 Shannon Falls, near the bottom of its 1000′ drop. So… the granite speaks to great amounts of time… and the waterfall–it speaks to the changing landscape. It falls down scoured and smoothed cliffs because the whole area has been shaped by glacial erosion. Not long ago, this area was under ice! (Longer though, than the beginning of planet Earth according to the Young Earthers). You can see some wonderful glacial polish and striations on fluted granite along the highway between the Chief and the town of Squamish. Glacially carved granite–right next to a large pull-out on the highway. click here for some more photos of intrusive igneous rocks. Crater Lake caldera, Oregon –some things happen quickly! Crater Lake never ceases to amaze me. It’s huge –some 6 miles (10 km) across, deep –some 1700 feet deep in parts –the deepest lake in the United States and 7th deepest on the planet– incredibly clear, and really really blue. And for volcano buffs, one of the best places ever! Crater Lake as seen from The Watchman. Wizard Island, which formed after the caldera collapse, occupies the center of the photo. Crater Lake is a caldera, formed when ancient Mt. Mazama erupted so catastrophically that it emptied its magma chamber sufficiently for the overlying part of the mountain to collapse downward into the empty space. That was about 7700 years ago. Soon afterwards, Wizard Island formed, along with some other volcanic features that are now hidden beneath the lake–and then over the years, the lake filled to its present depth. It’s unlikely to rise any higher because there is a permeable zone of rock at lake level that acts as a drain. Here’s one of the coolest things about the cataclysmic eruption: Not only was it really big, but it happened really fast. We know it was big because we can see pumice, exploded out of the volcano, blanketing the landscape for 100s of square miles to the north of the volcano –and we can see the caldera. We can tell it happened quickly because the base of the pumice is welded onto a rhyolite flow that erupted at the beginning stages of the collapse; the rhyolite was still HOT when the pumice landed on it! You can see the welded pumice on top the Cleetwood Flow along the road at Cleetwood Cove. pumice welded onto top of Cleetwood rhyolite flow at Cleetwood Cove. Note how the base of the pumice is red from oxidation –and forms a ledge because it’s so hard. Pumice blankets the landscape all around Crater Lake. 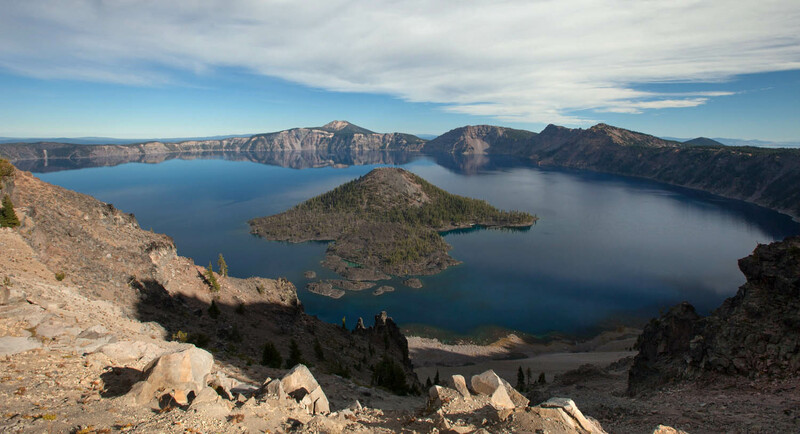 Crater Lake though, is so much more than a caldera –it’s the exposed inside of a big stratovolcano! Where else can you see, exposed in beautiful natural cross-sections, lava flow after lava flow, each of which erupted long before the caldera collapse and built the original volcano? 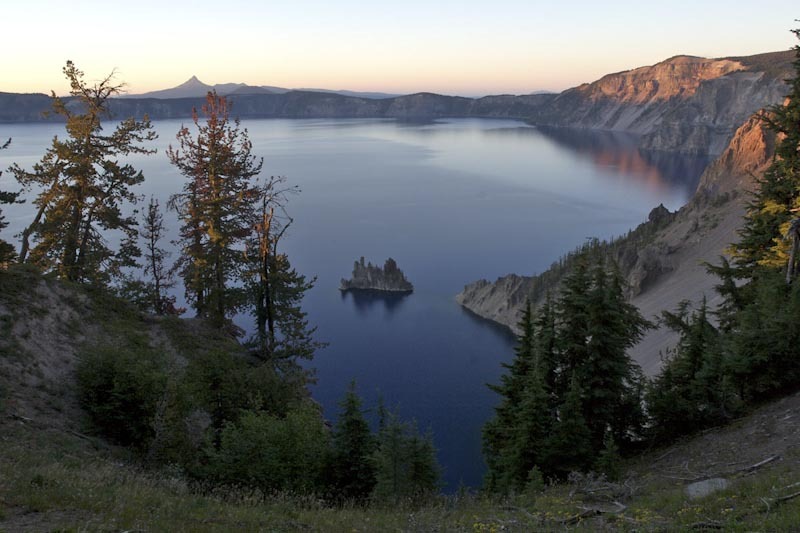 Within the caldera itself, these flows go back 400,000 years–the oldest ones being those that make up Phantom Ship –the cool little island (some 50′ tall) in Crater Lake’s southeast corner. Phantom Ship, in Crater Lake’s southeast corner, is made of the caldera’s oldest known rock, at 400,000 years old. I can’t resist. The caldera formed about 7700 years ago, incredibly recent in Earth history–incredibly recent in just the history of Mt. Mazama! To a young earth creationist though, that’s 1700 years before Earth formed. Now THAT’S amazing! Click here if you want to see a Geologic map of Crater Lake. Or… for more pictures of Crater Lake, type its name into the Geology Search Engine. 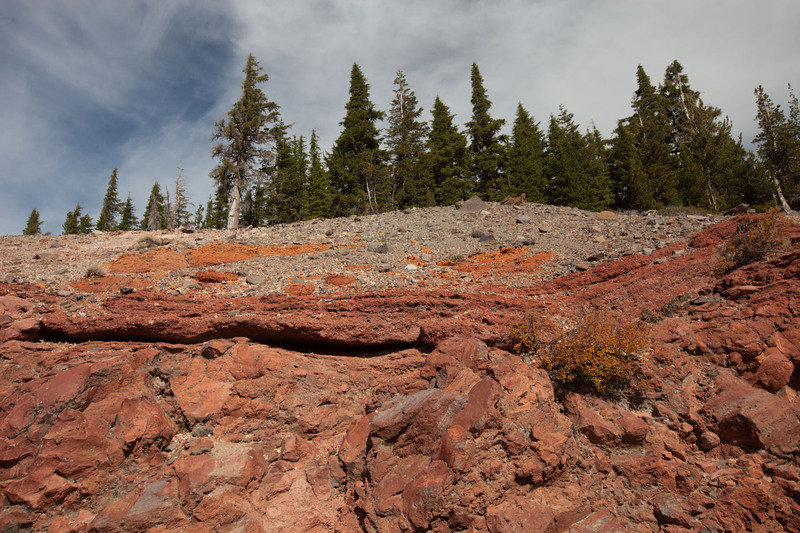 Or… check out the new Roadside Geology of Oregon book! Lake Abert’s one of the coolest lakes in Oregon –in my opinion. It’s got birds along its shoreline because it hosts a huge population of brine shrimp (which smell, by the way). 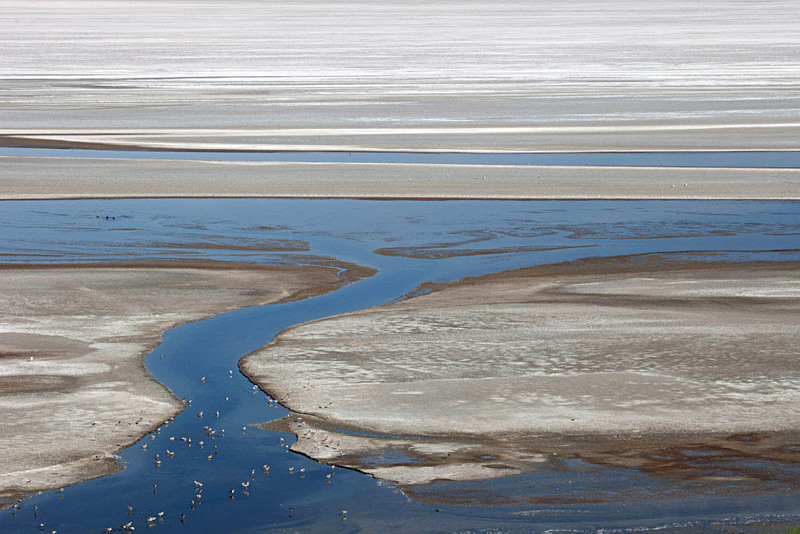 It has the brine shrimp because it doesn’t have any fish –and it doesn’t have fish because it’s an alkali lake in a closed basin, full of salt. The water that goes into this lake stays there, until it evaporates. When it evaporates, it leaves behind more salt. Birds along small creek that empties into Lake Abert, Oregon. Over the past few years, the lake seems to be drying up faster than usual–which makes all the sense in the world because we’ve had less rainfall than usual over the past few years. There’s still water, but it’s noticeably farther out into the “lake” than before. That’s certainly fast. We, as humans, can watch this lake dry up over just a few years. 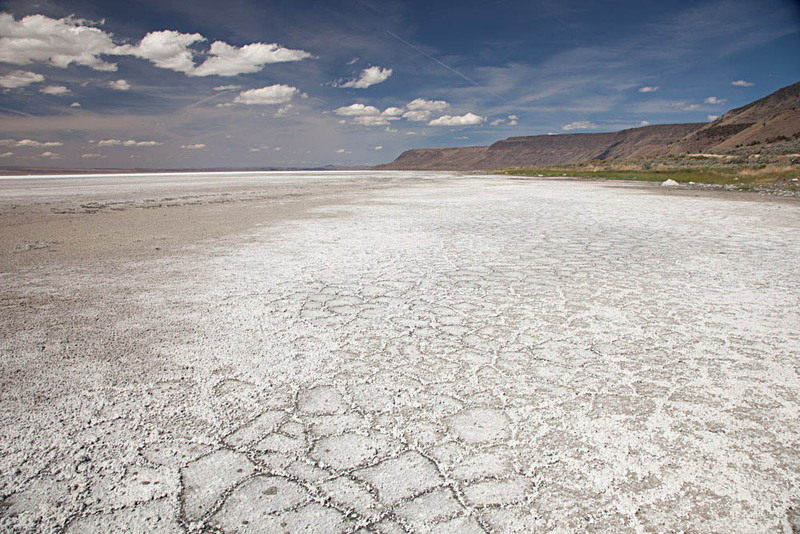 salt deposits at Lake Abert, Oregon, looking northward. 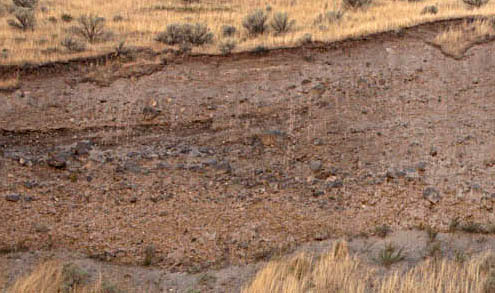 Abert Rim, along the right side of the photo, is uplifted along a normal fault. But think of what the lake was 20,000 years ago, at the height of the last glaciation! The physiographic map below shows Lake Abert (along US 395) as part of the much larger Lake Chewaucan, which included the even larger Summer Lake basin to the west. There’s all sorts of evidence for this earlier lake: old shorelines, deposits at elevations well above the modern lake, gravel bars. And Lake Chewaucan was only one of many such Pleistocene, or “pluvial” lakes that occupied closed basins in the Oregon and Nevada Basin and Range. Distribution of Pleistocene lakes in the southern Oregon Basin and Range. Of course these ages do a “time-number” on me. 20,000 years is a short time, geologically. So just yesterday, this region had many of these large large lakes –and in just a short time, they’ve dwindled to isolated remnants. But in just the last 5 years, those remnants have dwindled even more. It’s dramatic. It’s frightening. Odd too –those Young Earth Creation types think that planet Earth is younger than Lake Chewaucan! And really? Lake Chewaucan couldn’t have formed unless there was a basin there –and do you see the cliffs on the right (east) side of the lake? That’s Abert Rim, uplifted by a big normal fault –which is what formed the basin. So, the 2000′ of uplift on this fault must be older than the lake, which is older than planet Earth! Cool! For more photos of Lake Abert, type “Lake Abert” into the geology search engine. For information about the completely new (available in November, 2014) Roadside Geology of Oregon book.